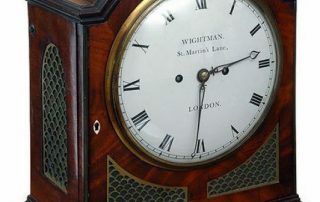 It is believed that the firm of Handley & Moore of Clerkenwell, London were specialist bracket clock movement makers who supplied retailers and clock assemblers, and the trade with movements. 1801 – 20 at Clarkenwell Close, London. The Thomas Wightman of St Martin’s Lane who was known to have been at this address in 1811 may have been the man above or a relative of the same name. Thomas Wightman (1) was known to have been working 1701 – 1745.